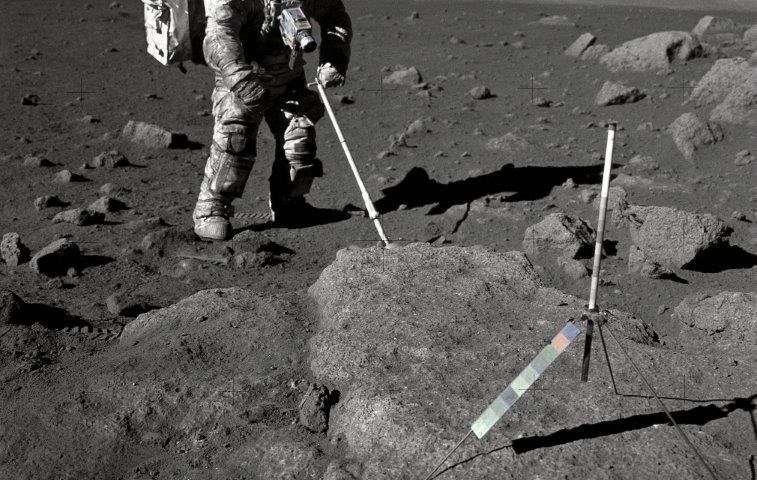 Geologist and astronaut Harrison Schmitt, Apollo 17 lunar module pilot, is pictured here using an adjustable sampling scoop to retrieve lunar samples during the Apollo 17 mission in December 1972. Lunar dust can be seen clinging to Schmitt’s space suit. New research finds breathing lunar dust could cause health problems for astronauts spending long periods of time on the moon. Credit: NASA. A new study finds simulated lunar soil is toxic to human lung and mouse brain cells. Up to 90 percent of human lung cells and mouse neurons died when exposed to dust particles that mimic soils found on the moon's surface. The results show breathing toxic dust, even in minute quantities, could pose a health hazard to future astronauts traveling to the moon, Mars or other airless planetary bodies. Space agencies know exposure to the space environment and zero gravity can be harmful to human health, but planetary dust poses an additional risk that has been mostly overlooked, according to the researchers. "There are risks to extraterrestrial exploration, both lunar and beyond, more than just the immediate risks of space itself," said Rachel Caston, a geneticist at Stony Brook University School of Medicine in Stony Brook, New York and lead author of the new study published in GeoHealth, a journal of the American Geophysical Union. Lunar dust caused reactions similar to hay fever in astronauts who visited the moon during the Apollo missions. Their experience coupled with the new study's results suggest prolonged exposure to lunar dust could impair airway and lung function, according to Bruce Demple, a biochemist at Stony Brook University School of Medicine and senior author of the new study. If the dust induces inflammation in the lungs, it could increase the risk of more serious diseases like cancer, he said. "If there are trips back to the moon that involve stays of weeks, months or even longer, it probably won't be possible to eliminate that risk completely," Demple said. The moon has no atmosphere, so its soil is constantly bombarded by charged particles from the upper layers of the Sun that stream through space. These charged particles cause lunar soil to become electrostatically charged, like static cling on clothing. When U.S. astronauts visited the moon during the Apollo missions, they brought lunar soil into the command module when it clung to their spacesuits. After inhaling the fine dust, Apollo 17 astronaut Harrison Schmitt described having a reaction he called "lunar hay fever" – sneezing, watery eyes and a sore throat. The Apollo astronauts' symptoms were short lived, but researchers wanted to know how lunar dust could affect astronauts' health long term and if it could cause problems similar to those caused by toxic dust on Earth. Previous research has shown breathing toxic dust from volcanic eruptions, dust storms and coal mines can cause bronchitis, wheezing, eye irritation and scarring of lung tissue. Dust particles can accumulate in a person's airways and the smallest particles can infiltrate alveoli, the tiny sacs where carbon dioxide is exchanged for oxygen in the lungs. Dust can also damage cells' DNA, which can cause mutations and lead to cancer, according to previous research. In the new study, Caston and her colleagues exposed human lung cells and mouse brain cells to several types of lunar soil simulants. Samples of lunar soil are too scarce and valuable to use in everyday experiments, so the researchers used dust samples from Earth that resemble soil found in lunar highlands and the moon's volcanic plains. 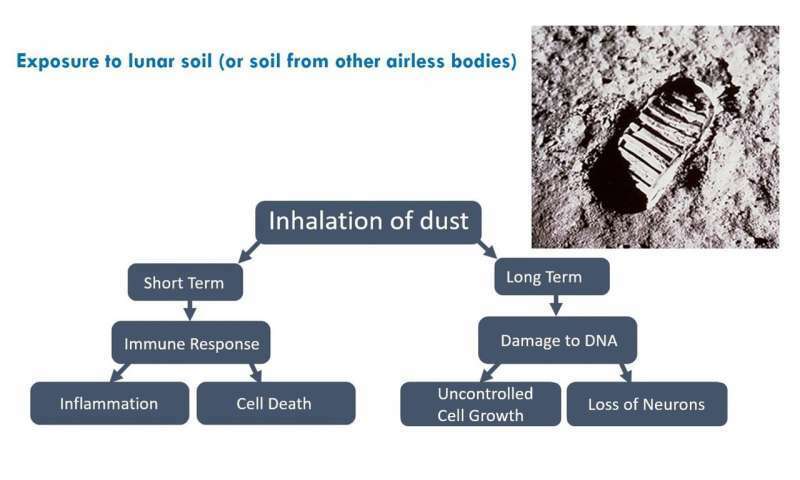 Caston grew the cells under controlled conditions and exposed them to the various types of dust. She counted how many cells were left and measured whether the simulants caused DNA damage. She found all the simulant types killed or damaged the cells' DNA to some degree. Simulants ground to a powder fine enough to be inhaled killed up to 90 percent of both cell types. The simulants killed the human lung cells so effectively the researchers couldn't measure the DNA damage. The simulants also caused significant DNA damage in mouse neurons. The results indicate lunar soil could cause health problems for humans spending long periods of time on the moon or other airless bodies, according to the researchers. When inhaled, the dust could irritate the throat, lungs and eyes of future astronauts. Over a long period of time, the continuing damage, irritation and inflammation would increase the risk of more serious disease, including cancer, Demple said. The researchers are unsure how the simulants kill cells, but they suspect they could be initiating an inflammatory response within the cell or generating free radicals, which strip electrons from molecules and prevent them from functioning properly. "....The results show breathing toxic dust, even in minute quantities, could pose a health hazard to future astronauts traveling to the moon, Mars or other airless planetary bodies. Space agencies know exposure to the space environment and zero gravity can be harmful to human health, but planetary dust poses an additional risk that has been mostly overlooked,..."
Gosh golly. This can't possibly be true. None of our comicbooks mention these problems. This has to be false! Spokesperson from Stupid AF University has given his opinion. Yep, still need that sarcasm font. Smallfry, check out the recent articles on this subject, about various research into Human habitation in space. Revealing a crescendo of problems, obstacles, complications, unproven assertions and unresolved impediments. In the comments, other commentators were disagreeing with me. On the basis of speculative fiction and Cinema/TV special effects & affects. Seems to me that Stupid University is giving degrees to those who read comicbooks and accept those as a reasonable depiction of the reality they "wish" to live in.